INDIANAPOLIS (Oct. 14, 2011)  Music for All's Bands of America Honor Band has received an invitation to perform in the 124th annual Tournament of Roses Parade, January 1, 2013 in Pasadena, California. The Bands of America (BOA) Honor Band is a national marching band, with student members selected from across the country. Bands of America is a program of Music for All. Music for All's mission is to create, provide and expand positively life-changing experiences through music for all. The Bands of America Honor Band will feature 300 outstanding high school student musicians and color guard performers, selected by recorded audition. "We envision a national ensemble featuring students from all 50 of the United States of America," says Eric L. Martin, President and CEO of Music for All. This will mark the third time Music for All's Bands of America Honor Band has performed in the Tournament of Roses Parade. 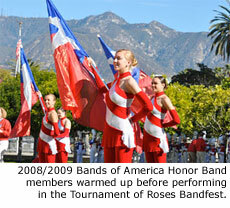 The BOA Honor Band also performed in the Tournament of Roses Parade in 2005 and in 2009, when it was a part of the President's Award-winning entry created with NAMM and Sesame Street Workshop. 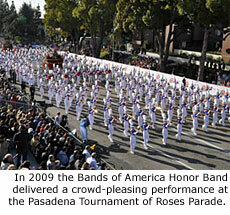 The band members, selected by audition, will meet for the first time in Southern California, December 27, 2012, to prepare for performances in the Tournament of Roses Bandfest field show and Rose Parade. The 2013 BOA Honor Band of America will be directed by Bob Buckner, who recently retired as director of the Western Carolina University "Pride of the Mountains" Marching Band, recipient of the prestigious Sudler Trophy in 2009 from the John Philip Sousa Foundation. Mr. Buckner has distinguished himself in the field of music education and in the marching pageantry field. His Sylva-Webster High School band was the 1979 Grand National Champion at the Bands of America Championships, and in 2011, his "Pride of the Mountains" Marching Band was voted as fan favorite of the Tournament of Roses Parade. Mr. Buckner also taught at East Tennessee State University and has served as an adjudicator, clinician, and guest conductor throughout the United States and Canada. His consulting associates include the United States Marine Drum and Bugle Corps, and he is the founder of United Music Enterprises. Mr. Buckner will lead an instructional staff of all-star music educators who will work with the students as they learn, rehearse and prepare for their performances at Bandfest and the Rose Parade, putting it all together in just a handful of days. Application is open to all high school band members. Application packets will be available after November 15, 2011 on musicforall.org or by calling 317.636.2263. The deadline to apply and to submit audition recordings will be published with the application packet. Winds will audition using SmartMusic interactive music software. All applicants receive a complimentary 90-day SmartMusic subscription to prepare and submit their audition. Percussion and color guard members are selected by video audition. Music for All sponsors and partners will also play an important role in preparing the BOA Honor Band for their performances. Yamaha Corporation of America, MFA's National Presenting Sponsor, will provide percussion and brass instruments. Fred J. Miller, Inc. (FJM) will outfit the members in custom uniforms designed by award-winning designer Michael Cesario, one of the nation's leading pageantry visionaries. Music Travel Consultants, MFA's Official Student Travel Partner, will manage the travel, housing and logistics for the band members and their families. About Music for All: Music for All (MFA) is one of the nation's largest and most influential organizations in support of active music making. Since 1975, MFA, through its Bands of America and Orchestra America programs, has been a destination and set the standard for scholastic music ensemble performance and music education advocacy. A 501(c)3 not-for-profit educational organization, MFA uses its national profile programming to recognize, model, showcase and provide individual, teacher and organizational examples of music performance excellence and achievement. MFA's programs include 20 annual events, including the Bands of America Grand National Championships and Regional Championships for marching band, the Music for All Summer Symposium camp for students and teachers and the Music for All National Festival for concert bands, orchestras and percussion ensembles. Music for All's programmatic model is designed to mirror and supplement the classroom and performance model adopted in most American scholastic settings. Text and logo courtesy of Music for All. Photos by Marching.com. Copyright 2011 Marching.com. All rights reserved. This material may not be published or redistributed without permission.